Of the party’s best-known possible candidates, only Mitt Romney has broad potential appeal. 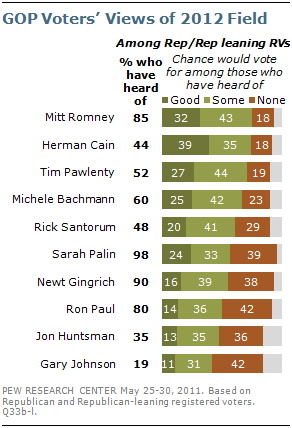 Large majorities have heard of four possible Republican candidates – Romney, Sarah Palin, Newt Gingrich and Ron Paul. But most who have heard of Palin and Gingrich say there is no chance they would vote for them (63% each). About as many (60%) say there is no chance they would support Paul. By contrast, far fewer voters (44%) who have heard of Romney have ruled out voting for him, while 51% say there is at least some chance they could support the former Massachusetts governor. The latest national survey by the Pew Research for the People & the Press, conducted May 25-30 among 1,509 adults (including 1,227 registered voters), finds that Barack Obama continues to hold a sizable lead against a generic Republican opponent in next year’s election. Currently, 48% of registered voters say they would like to see Obama reelected while 37% would prefer to see a Republican elected. This is little changed from March (47% to 37%). Obama’s job approval rating, which rose after the killing of Osama bin Laden, remains positive. Currently, 52% of the public approves of his job performance while 39% disapprove. Last fall, after his party’s weak showing in the midterm elections, as many disapproved as approved of the way Obama was handling his job as president (44% each). Obama’s personal image also remains strong. Large percentages continue to view Obama as a good communicator (75%) and warm and friendly (73%), and more see him as a strong leader than did so in January (58% now, 53% then). The new survey finds that among the Republican candidates, Herman Cain has made a positive impression on the relatively small share of voters – mostly Republicans – who have heard of him. Just 33% of voters have heard of Cain. Among them, 23% say there is a good chance they will vote for the former business executive and another 25% say there is some chance they would vote for him. Among the 44% of Republican and Republican-leaning voters who have heard of Cain, 39% say there is a good chance they would vote for him, while 35% say there is some chance. 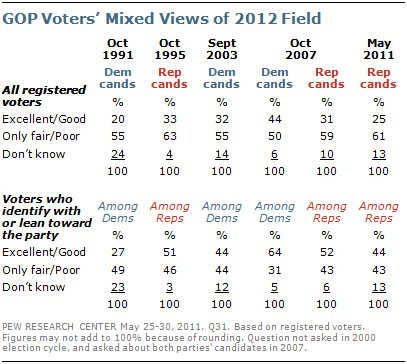 Nearly twice as many Republican voters have heard of Romney (85%). Among this group, 32% say there is a good chance they would vote for him and 43% say there is some chance. Smaller majorities of GOP voters who have heard of Palin, Gingrich and Paul say there is at least some chance they could support them (57% Palin, 56% Gingrich, 50% Paul). Roughly four-in-ten Republican voters say there is no chance they would support Palin (39%), Gingrich (38%) and Paul (42%). At this early stage in the race, Republican and Republican-leaning voters express mixed views of the possible GOP field as a whole: 44% say the possible candidates are excellent or good, but about as many (43%) say the party’s candidates are only fair or poor. Republican voters had only a somewhat more positive view of the GOP field at a later point in the 2008 campaign. 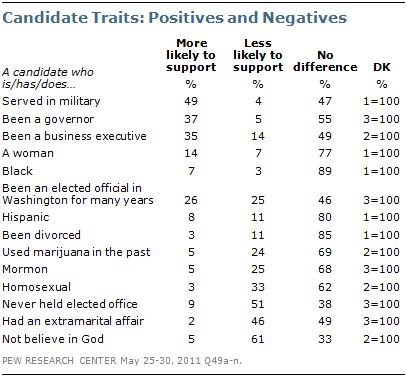 In October 2007, 52% rated the candidates as excellent or good while 43% said they were only fair or poor. Republican voters’ current ratings of their party’s possible candidates are comparable to Democratic voters’ ratings of their party’s candidates in September 2003. The survey finds that in assessing traits and characteristics of presidential candidates, the public values prior experience as a governor or business executive more than experience as an elected official in Washington. Nearly four-in-ten Americans (37%) say that, in general, they would be more likely to support a candidate who has been a governor, just 5% say they would be less likely to support such a candidate and 55% say it would make no difference. Past experience as a business executive also is seen as an asset; 35% say they would be more likely to vote for a candidate who has been a business executive, although 14% would be less likely to support such a candidate; 49% say it would make no difference. The public has mixed views of a presidential candidate who has been an elected official in Washington for many years. As many say they would be less likely to back such a candidate (25%) as more likely to support them (26%). During the last presidential campaign, long experience as a Washington politician was seen more positively. In February 2007, 35% say they would be more likely to support a candidate with long-time Washington experience compared with 15% who said they would be less likely. As was the case during the last campaign, prior service in the military is viewed very positively. Nearly half (49%) say they would be more likely to support a candidate who has served in the military, the highest percentage for the 14 traits and characteristics listed. Among traits perceived negatively, 61% say they would be less likely to support a presidential candidate who does not believe in God, which is little changed from four years ago. A past extramarital affair is viewed even more negatively today than in 2007: Currently, 46% say they would be less likely to support a candidate who had an extramarital affair, up from 39% in February 2007. A third of Americans (33%) say they would be less likely to support a presidential candidate who is homosexual, which is sizable decline from 2007 (46%). In the new survey, 62% say it would not matter if a candidate is homosexual, up from 51% four years ago.